CRYSTAL HEALING, as defined by Katrina, incorporates all aspects of the being – from the subtlest spiritual awakenings to the release of mental and emotional blockages that can create physical disease. It is a healing modality that works directly with the light, color, beauty and perfect geometric forms that the mineral kingdom provides to assist us in balancing all aspects of our being. It is an advanced healing art that has the capacity to influence the physical, mental, emotional and spiritual bodies. 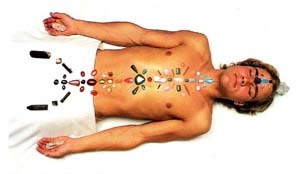 Specific stones are placed upon the chakras, or spiritual energy centers, of the body. Since each one of the chakras has an associated color, generally speaking the crystals or stones reflecting that specific color would be placed upon these physical nerve plexus points. Bearing in mind that each stone has its own specific healing properties, each stone that is placed upon the body serves its own purpose. The chakras are activated and the aura (or electro-magnetic force field surrounding the body) is infused with the light reflecting off of the stones making it possible to access much more subtle levels inner being and consciousness. When applying proper Crystal Healing Therapeutics deep personal sources of healing energy can be accessed, as understanding and knowledge about oneself surfaces from inner sanctums of knowing. From this foundation of personal empowerment mental awareness is elevated, the emotional body becomes hypersensitive, and the memory veils are lifted. The corresponding mental, emotional and spiritual causes of physical disease can be discovered and attended to. In this way the power of the crystals and stones can be harnessed and their energies used to create healing, balance and upliftment.